Andrew Taggart and Sean Kafka, Dallas, South Dakota, purchased Lot 2 at $6,500. Todd Novotny, of Novotny Angus, Winner, South Dakota, purchased Lots 40 and 42, each at $12,000. Location: at the ranch south of Dallas, S. Dak. 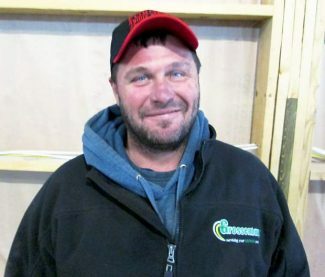 The Forgey and Graesser partnership continues to build on their reputation and repeat buyers. 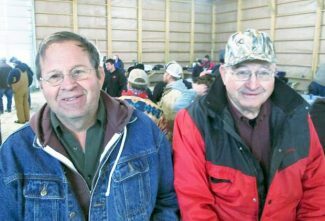 They hosted a packed house for their annual bull sale held at their new sale barn at Dan Forgey's place. There were snowflakes in the air, but that didn't stop this big crowd. This was a really stout set of bulls, bred for the hills of south central South Dakota and the Sandhills of northern Nebraska. This program breeds for longevity and disposition, which was very evident as I sorted through the bulls before the sale. The bulls are all yearlings, with the bulk of the offering being Angus, with a few Sim-Angus cross bulls. The Graesser brothers, consisting of Kevin, Rod, and Derek, along with Dan and Lyn Forgey of Heart F Angus, have established a lasting relationship with their customers, many are their close neighbors. The older I get, the more I see that this whole business is about people. This firm offers free delivery, a volume discount, and a breeder guarantee to go along with an outstanding dinner before the sale. Top selling bull of the day went to repeat buyers, Ponca Creek Cattle from Bonesteel, South Dakota. This bull was Lot 63, HFA Chancellor X89C, and sold for $25,000. He was a son of Baldridge Xpand X743, and out of Baldridge Pratissa W165, a daughter of GAR-EGL Protégé. With only a 62 pound birth weight, he weaned at 833 pounds, and posted a yearling weight of 1,447 pounds. His 39 cm. scrotal measurement was complemented by EPDs of CED 10, BW -1.2, WW 64, YW 115, MILK 25, and $B 163.25. Stevenson Diamond Dot Angus from Hobson, Montana, chose Lot 18 at $16,000. He was a son of Barstow Cash, and out of a SAV 8180 Traveler 004 daughter. Born at 76 pounds, he weaned at 776 pounds and reached a yearling weight of 1371 pounds. His EPDs were CED 8, BW 1.9, WW 61, MILK 24, and $B 158.56. His IMF index was 132 with a rib eye index of 107. Redman Angus from Burwell, Nebraska, selected Lot 25 at $13,500. He was by Vision Unanimous, and out of ALC Rachel P37R, a daughter of GAR Retail Product. He had a 96 pound birth weight, a weaning weight of 870 pounds, and a yearling weight of 1,550 pounds to gain 4.25 pounds a day. His EPDs included BW 3.2, WW 71, YW 119, MILK 21 and $B 172.00. He had a 15.8 square inch rib eye. 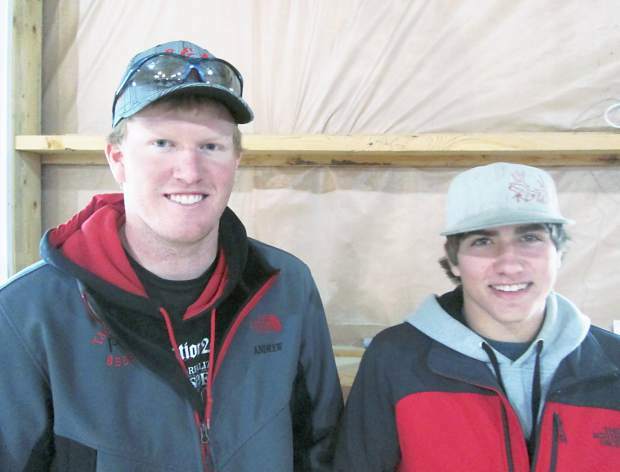 Novotny Angus from Winner, South Dakota, bought two really good bulls in Lots 40 and 42, each at $12,000. The Lot 40 bull was a son of S Chisum 6175. This was one big, stout made bull with a hump in his neck, and built like a linebacker. In addition, he seemed to have all the right numbers. Born at 84 pounds, he weaned at 886 pounds and grew to a yearling of 1,558 pounds, gaining 4.4 pounds per day. He scanned a 17.1 square inch rib eye and a pelvic of 210 square cm. He had a 42 cm. scrotal measurement. His EPDs were CED 8, BW 1.0, WW 72, YW 121, MILK 24, and $B 178.53. Lot 42 was another son of S Chisum 6175, and he was out of a daughter of MCC Daybreak. He entered the world at 86 pounds, and grew to a yearling weight of 1,566 pounds, with an ADG of 5.3 pounds per day. With an IMF ratio of 115 and a pelvic of 198 square cm., his EPDs were BW 2.6, WW 61, YW 117, MILK 22, and $B 158.26. His rib eye measured 14.8 square inches. Lot 31 sold for $11,000 to Assman Land and Cattle, Mission, South Dakota. Here was another good bull with all the right numbers, sired by SAV Resource 1441 and out of a daughter of Mytty In Focus. Highlights include a 78 pound birth weight, 843 pound weaning weight, ADG of 4.7, Scrotal 40 cm., and $B 170.53, plus excellent EPDs. At $7,500, Lot 134 sold to Dale Stewart of Newport, Nebraska. This grandson of Connealy Impression had a 15.2 square inch rib eye.